This is such an exciting time for a new parent, so many things to learn, so much more responsibility and to top it off, a lack of sleep! Capturing these first few days in images is such a treasure, your little baby will grow so fast it will be hard to remember how small they actually were. A newborn baby’s portrait session is a bit different from any other session, so I have included some tips so that you won’t be surprised or caught off guard. The space where the baby will be photographed will be warm, around 82 F. This temperature will keep the baby comfortable when it is naked so lightweight clothing is recommended for the parents so that you are comfortable as well. Newborn sessions can take a few hours, everything stops if the baby needs to be fed, burped, comforted or changed, so it is not all photography time. So don’t set up something time sensitive afterwards. There is no need to purchase any clothing for your baby for the session. Most clothing for newborns is sized so that they can grow into it which unfortunately means that they will be too baggy and loose for portraits. Wraps and blankets are great additions to the naked newborn images and lots of photographers will have some specially sized clothing as an option. Some of those images you’ve saved on Pinterest and other sites that made you say ‘how did the baby do that?’ were probably composites. No baby can safely rest their head on their hands at this age without support. So sometimes you will be asked to support a baby in two different ways so the photographer can merge the two different images. Someone or something is likely to get peed or pooped on during the session. This could be you, the photographer or some of the blankets and props used during the session. Relax, everything gets washed after the session. 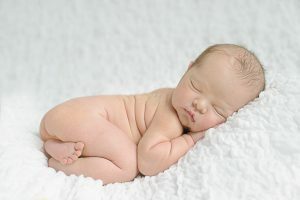 Most newborn sessions are scheduled in the mornings, newborns seem to be calmer in the mornings than in the afternoons. Let the photographer know if you have had a c section, they will make sure to accommodate you in your poses. Be flexible with feedings. I know some moms are adamant about sticking to a schedule or monitoring ounces. Even if your baby has just finished eating, almost all of the babies want just a little bit more after being moved to help them fall deeply asleep. Babies also seem to eat more during their sessions, after all, modelling is tough work!